Humans have co-evolved alongside numerous other organisms, some having a profound effect on health and nutrition. As the earliest pharmaceutical subject, pharmacognosy has evolved into a meta-discipline devoted to natural biomedical agents and their functional properties. While the acquisition of expanding data volumes is ongoing, contextualization is lagging. Thus, we assert that the establishment of an integrated and open databases ecosystem will nurture the discipline. 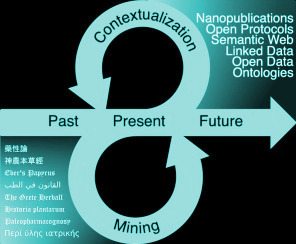 After proposing an epistemological framework of knowledge acquisition in pharmacognosy, this study focuses on recent computational and analytical approaches. It then elaborates on the flux of research data, where good practices could foster the implementation of more integrated systems, which will in turn help shaping the future of pharmacognosy and determine its constitutional societal relevance. Unfortunately this invited article is not open-access (the cost was >$4,000). It will be made available in a bit less than a year on PubMedCentral per-NIH mandate. But I’ll soon put the post-print (not the publisher version as it is not allowed) in here.